This beef strips stir fry dish is cooked with soybean sprout in black pepper sauce. A little spicy combines fragrance of bean and beef. It's also a perfect combination of animal protein and plant protein, suitable to eat in spring. 1. Cut beef into thin strips. Marinate in Marinade Sauce for 30mins or overnight. 2. Wash soybean sprout, boiling for 5 to 10mins. Drain well. Set aside. 3. Heat oil in a wok till about 30% cooked, add beef strips. 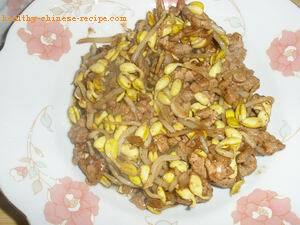 Quickly stir fry till the beef turns into white color. 4. Add Seasoning, sway the wok till fragrance comes out. Add soybean sprout, stir fry several times till oil coated, about 60 seconds. 5. Put back beef, stir fry. Add Black Pepper Sauce. Quickly stir fry till cooked and thicken. 6. Turn off heat. Serve with warm. The beef cannot be over cooked. Quickly take out when its color changes. When put back, the dish will be done in seconds (after stir fry several times).